The newest long range XHP35 HI thrower from Niwalker promises a lot. 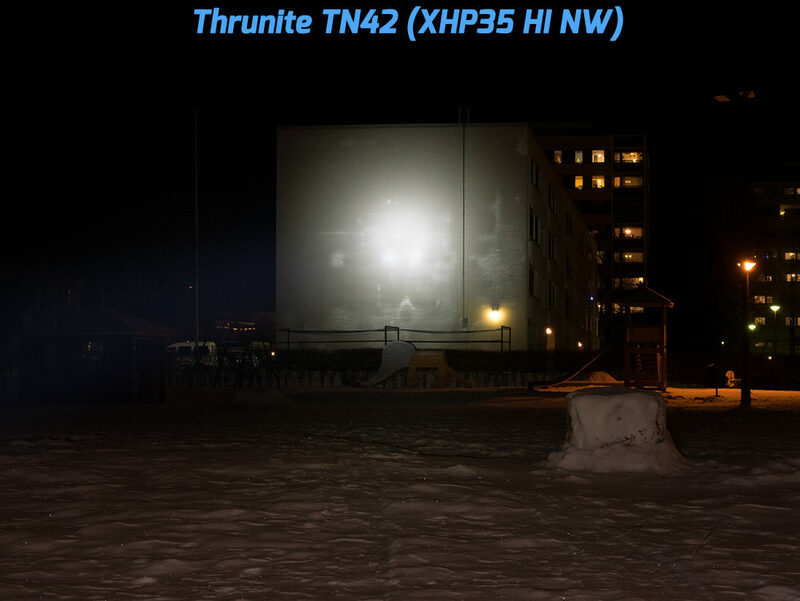 With a specified range of 1600 meters it should be in the same class as the Thrunite TN42 and Acebeam K70. What sets the BK-FA30S apart is the triple switch system, which lets you program two desired modes to the auxiliary buttons while the main switch operates in the usual way. 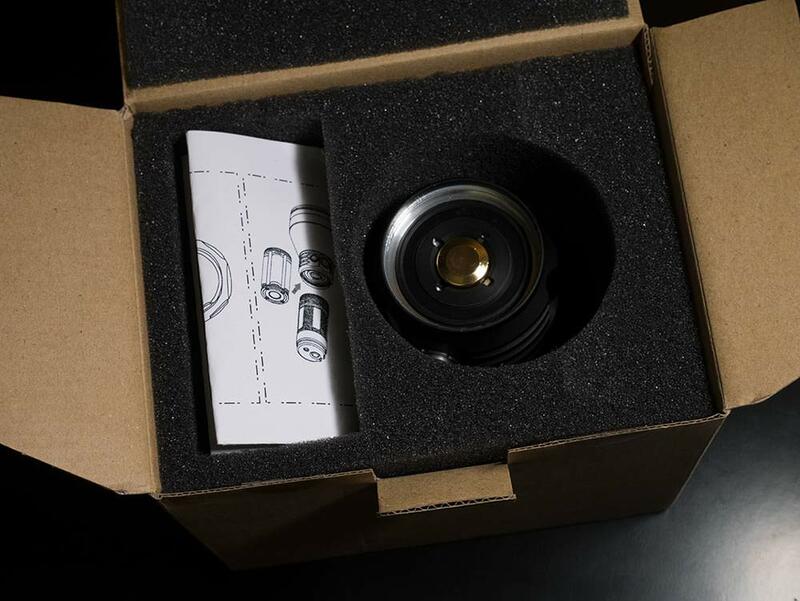 The box is plain brown cardboard with the specs attached on the top. The light is shipped unassembled to save space, you’d never think a 100mm thrower fits there. I wished there was a longer shoulder strap instead. 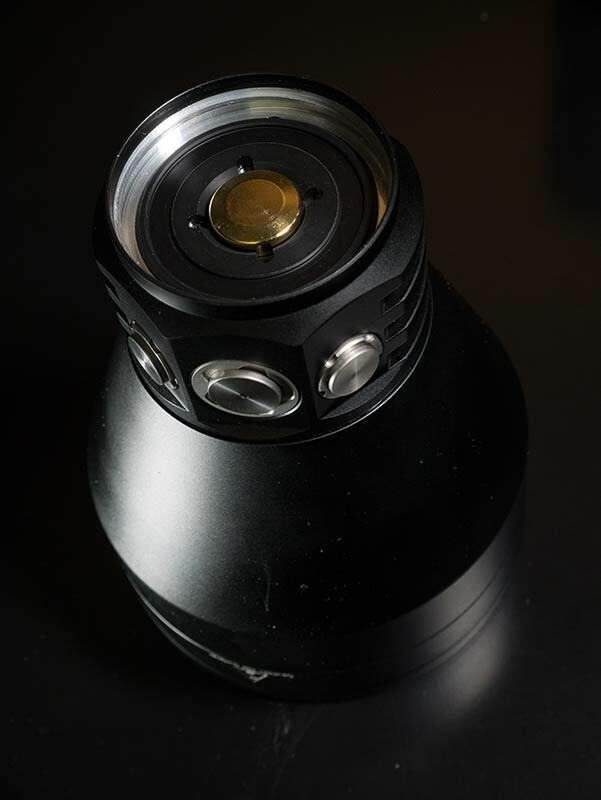 Other retaining options include standard tripod threads. 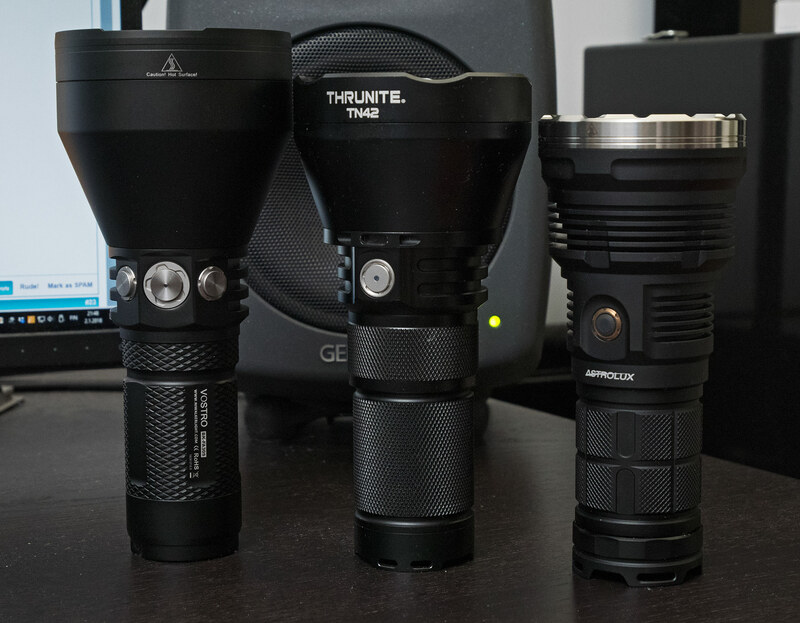 The BK-FA30S is a big light, but not too heavy, lighter than the Thrunite TN42 and the Astrolux MF02 for example. Batteries are inserted into a 4S carrier. The springs are long enough to make good contact with unprotected flat tops. Protected button tops also fit fine. Protection circuits aren’t absolutely necessary, since there is low voltage cutoff in the driver. Just remember to use similarly aged and identical model batteries for maximum safety. The current draw isn’t too high, only a couple amps, so the basic NCR18650Bs with protection will work fine. The tailcap has a locator light which is activated via the switch. It alternates between red and green. There’s three switches on the side of the light. The middle one acts as a normal electronic switch with memory. 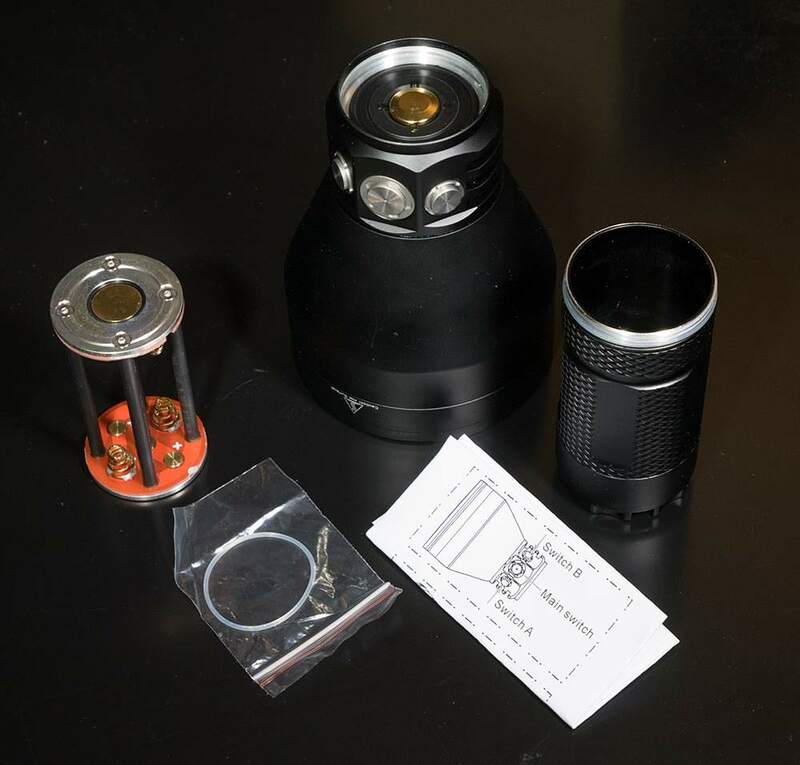 The surrounding ones can be programmed to any of the modes including Turbo/L6, strobe, sos and warning flash. The main switch cycles normal modes L1 through L5, and the maximum output is activated momentarily by pressing and holding the switch from off. If you release the switch and press is again right away, L6 will stay on. The switches don’t quite have the same quality feel to them as the TN42. The travel is a bit larger and there’s a bit of play if you press the edge of them. Nothing serious though, and there was no actuation problems during my testing. There’s a good distinct click to them too. The memory with the extra buttons and momentary turbo with a hold of the main switch are great. You can also switch from momentary turbo to constant turbo by releasing and pressing the switch again. There was some strange behavior to the main switch memory. It doesn’t always memorize the mode if you use either of the auxiliary buttons. Say you have the left button as L1 and the right one as L6. You turn the light on with the main switch and cycle up to L2. Now the L2 is memorized if you turn the light off and switch it back on with the main switch. If you activate L1 by pressing the left switch and turn it off using the same left switch, the middle button turns the light on L1, not mid. If you click the light on with the right switch to the memorized L6 and then turn the light off the main switch will always turn the light on L2 regardless of the mode you previously used. 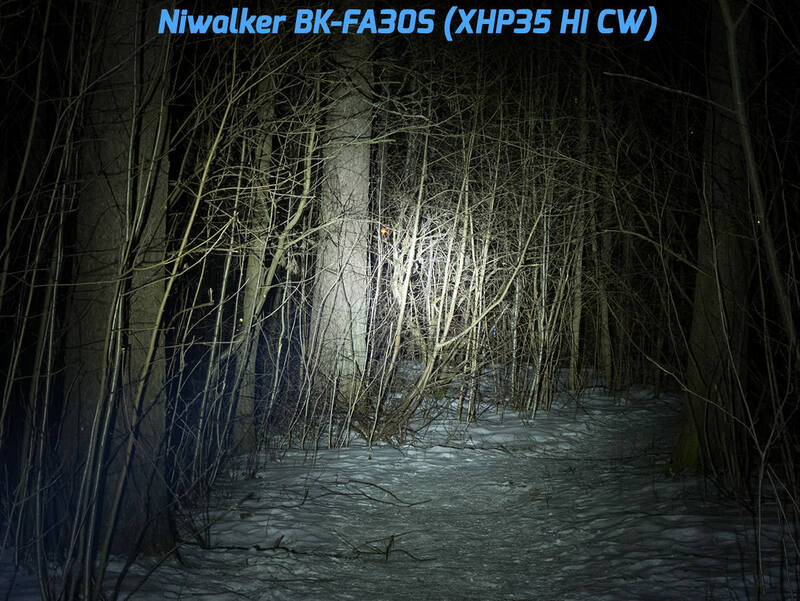 The BK-FA30S is a big light. 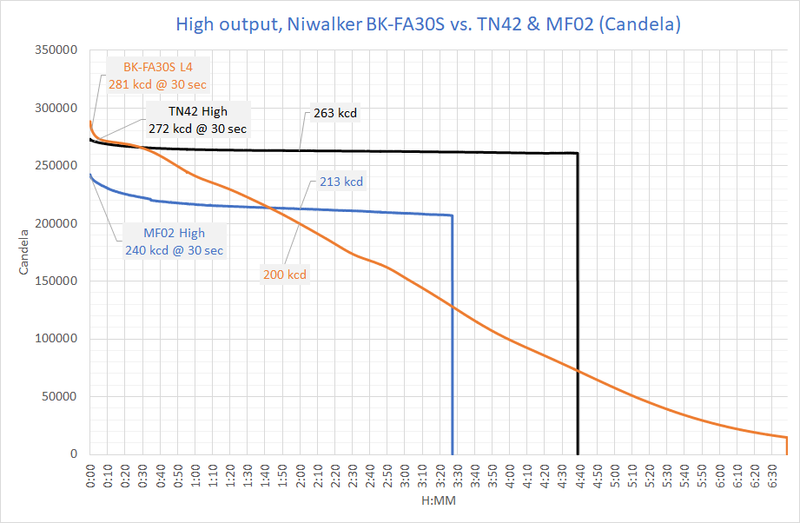 Nowhere near the BLF GT, but bigger than the TN42. Despite the measurements, the difference between the three throwers is small. 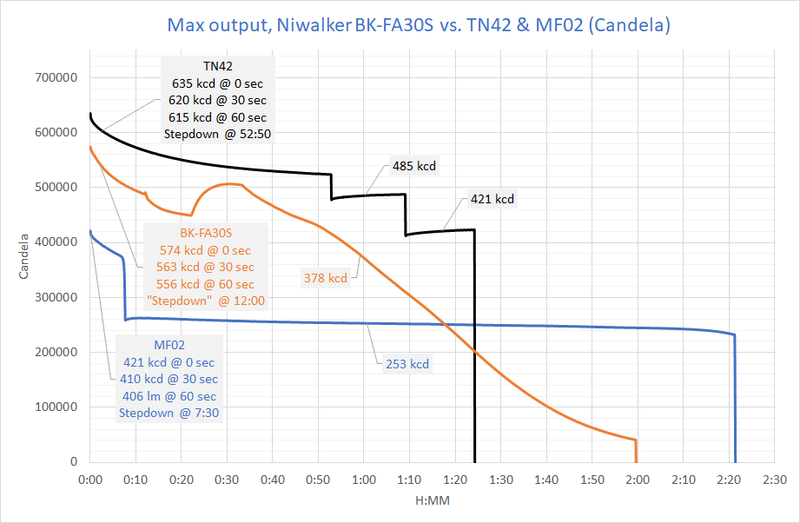 What is apparent though, is that the TN42 has best focused spot with least spill. Its warmer color temperature is also more useful in real life. 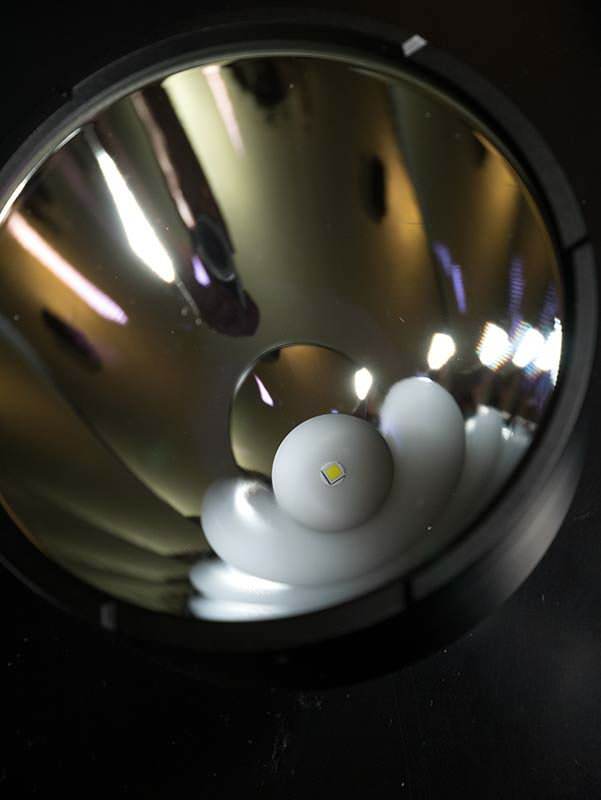 The beam is what you’d expect from a large smooth reflector light using the Cree XHP35 HI. 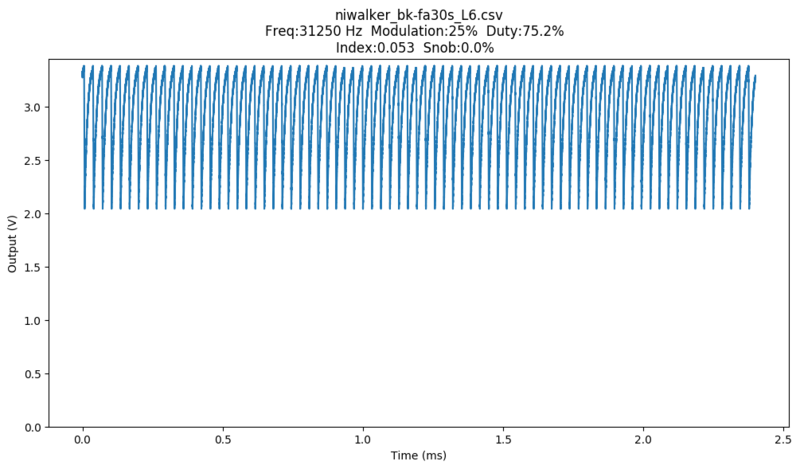 There’s a small well focused hotspot which transitions to the spill in two phases. 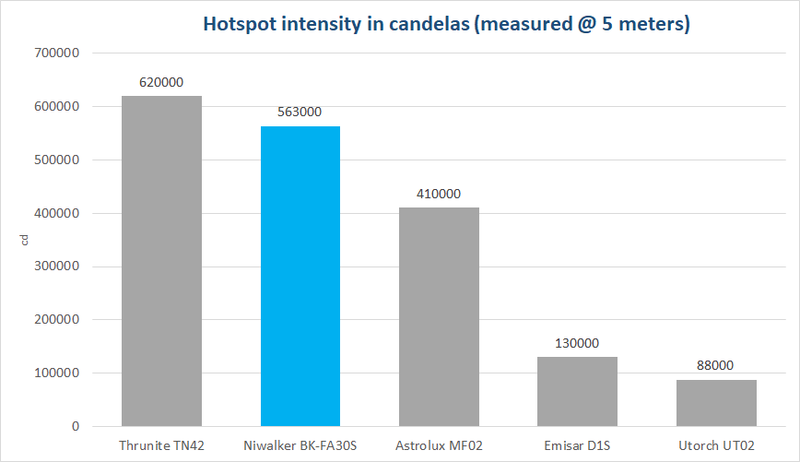 Even though the tint shift can be seen from the measurements, it is moderate and not distracting at all, since the intensity outside the hotspot is very very low in comparison. The tint changes a lot in different modes. Higher modes are cooler and more neutral (closer to the black body line). None of the lower modes look that obnoxious to me though. There’s no rings or other visible artifacts in the beam. Tint in different brightness modes. Tint in different parts of the beam. TM-30 = The newest color rendering method using 99 samples. Preferred for comparing LEDs. 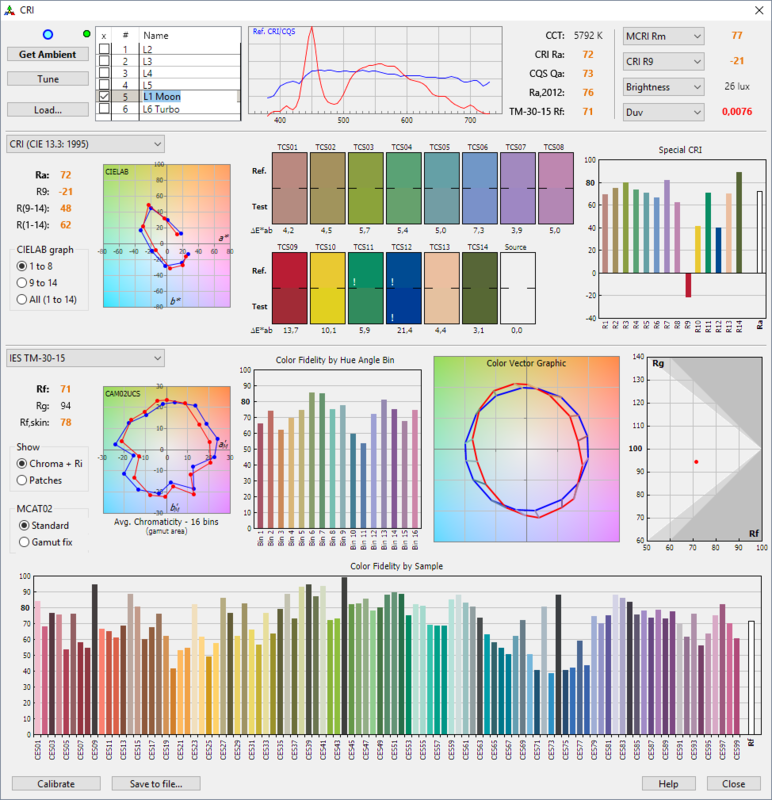 TM-30 (Rf) = Accuracy of colors, fidelity index. Replaces CRI(Ra). TM-30 (Rg) = Gamut of colors, saturation index. Higher number means more saturated colors. Tint dev. (“Duv” in the CTA screenshots) is the tint’s distance to the black body radiator line in the CIE graphs. The higher the number, the greener the tint. 0,0000 means absolutely neutral white and negative numbers mean rosy/magenta tint. Anything over 0,0100 can be described as visibly green. All tests were done with a set of unprotected Samsung 30Qs. 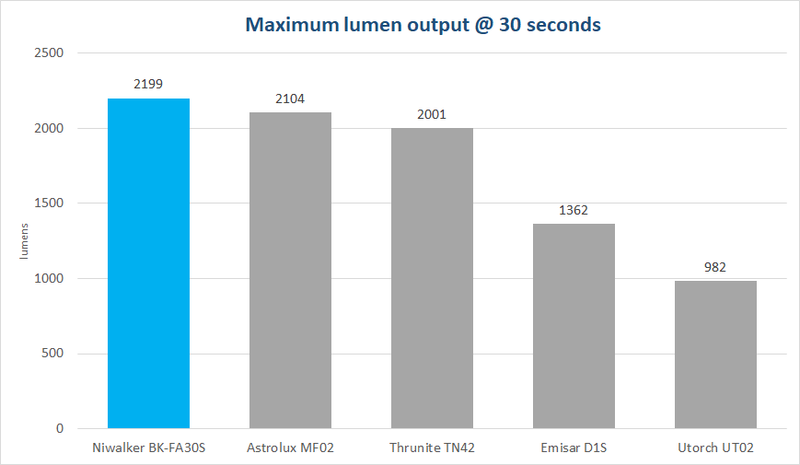 Lumen output matches the manufacturer’s specifications, but the throw lags behind a bit. I would probably get a bit higher numbers with longer measurement distances. Throw was measured at 5 meters. 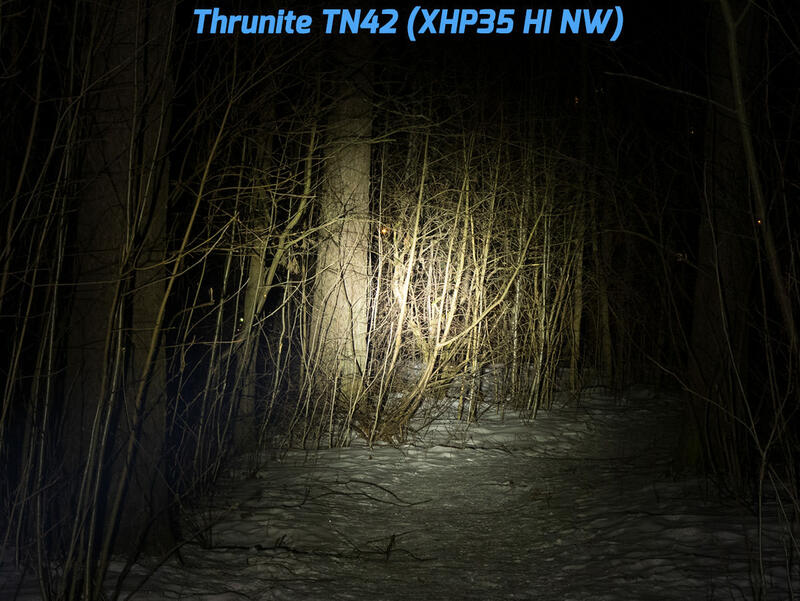 The difference to the Thrunite TN42 is only about 10% which isn’t very visible in real life. However, the output decreases as the batteries deplete. 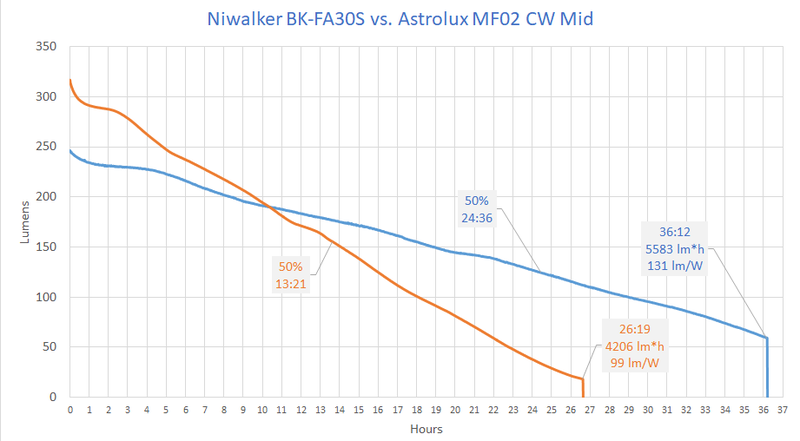 The BK-FA30S still produces more throw than the Astrolux MF02 for well over an hour. 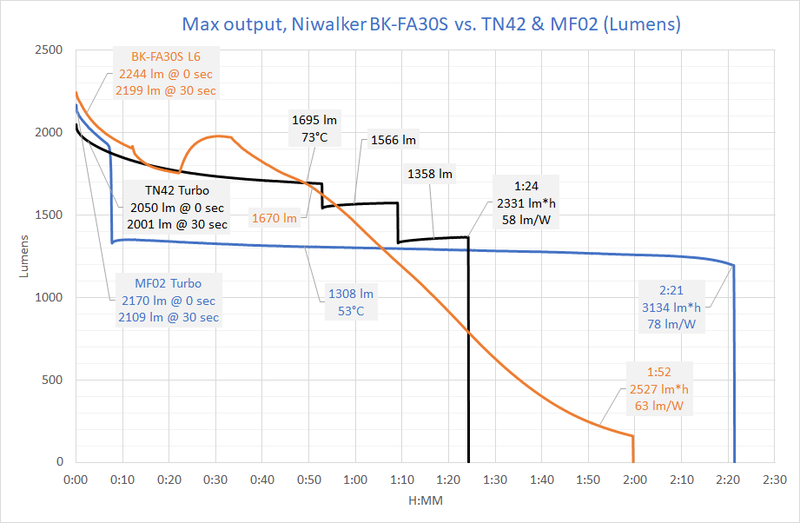 Lumen output is very comparable to the Thrunite TN42 over the whole runtime but due to lower efficiency, the Niwalker gets a bit hotter and has to be actively cooled not to cause damage to the batteries. The light automatically shuts off when the battery pack drops below a certain voltage (10.9V). This works great as long as you don’t have a badly mismatched set. Due to the electronic switch, there’s some parasitic standby current when the light is switched off. The drain is insignificant and it would take 30 years to drain a set of 3000mAh batteries. 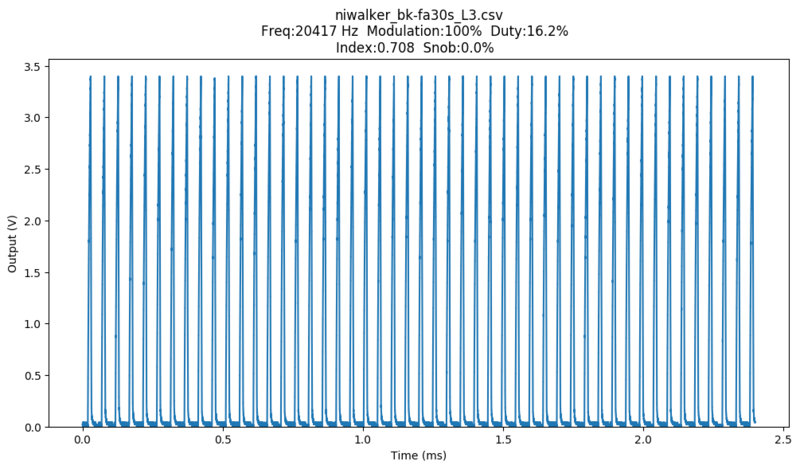 I measure the flicker with a Thorlabs DET36A/M photodetector and an oscilloscope. Here are the explanations for the data acquired. 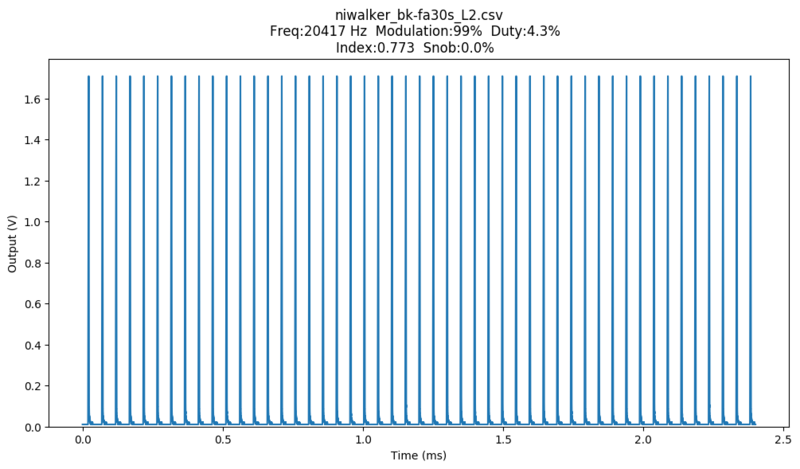 Index: flicker index is calculated using the area under the curve (link is external). This integral is separated into area above and below the average output. The index is the area above that average divided by the total area. 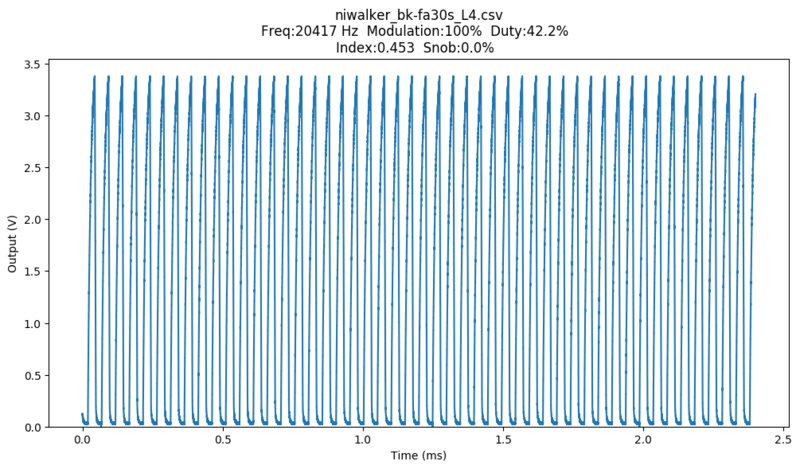 A pwm light with a duty cycle of 50% will have a flicker index of 0.5, but it is more useful with more complicated periodic waveforms, especially those whose modulation is less than 100%. 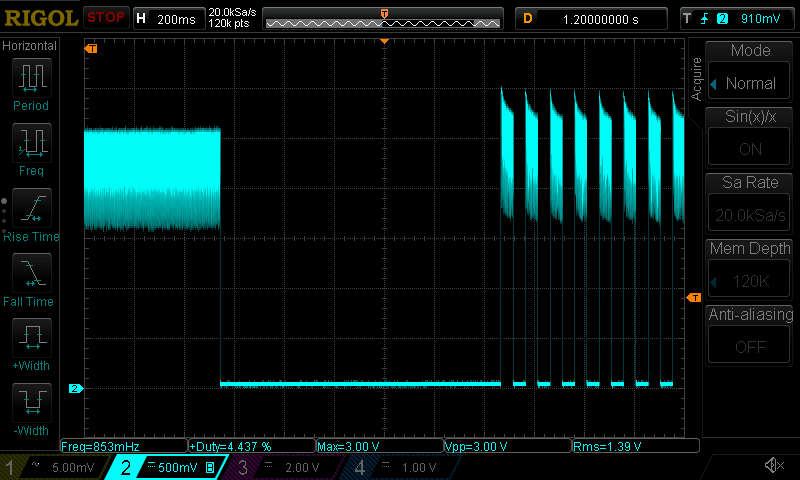 PWM is used on all the modes except maximum (L6), although it also shows some ripple. 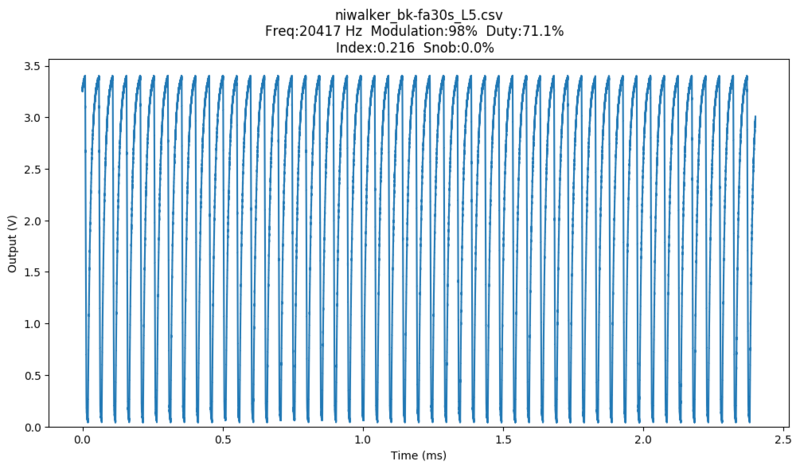 The frequency is high at over 20kHz so the flicker will not be visible to the naked eye on any of the modes (flicker snob index 0%). A camera with a high speed shutter may pick it up though. 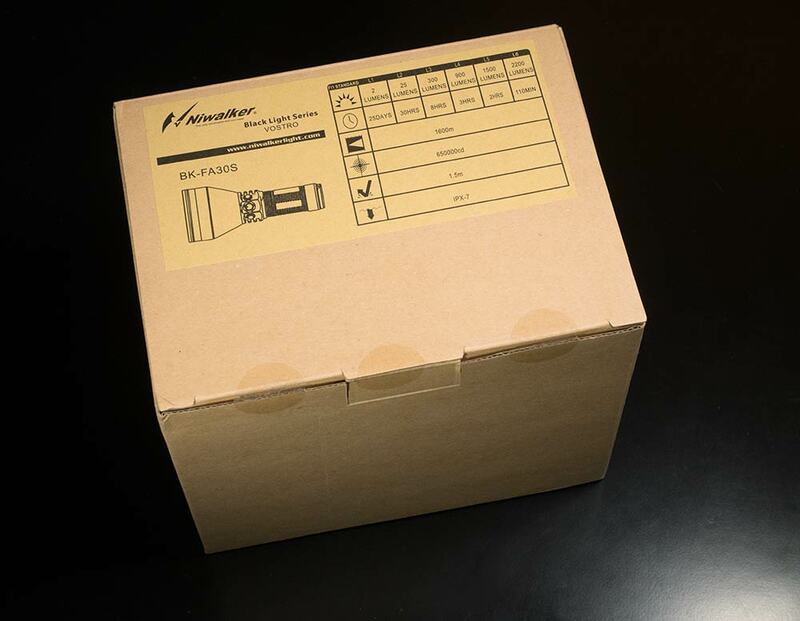 Strobe operates at 10.2 hertz reaching an output a bit above maximum constant level (L6). Here’s the transition from L6 to strobe. 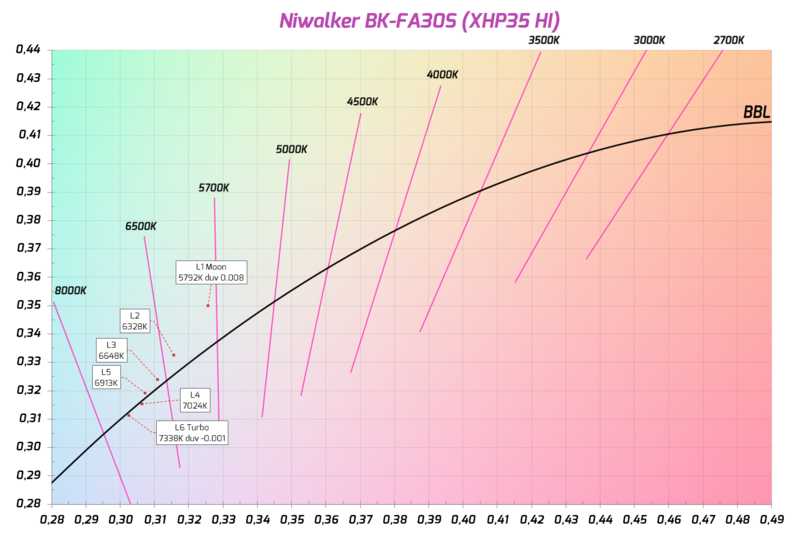 Niwalker says the BK-FA30S has “advanced thermal protection circuit prevents overheating”. 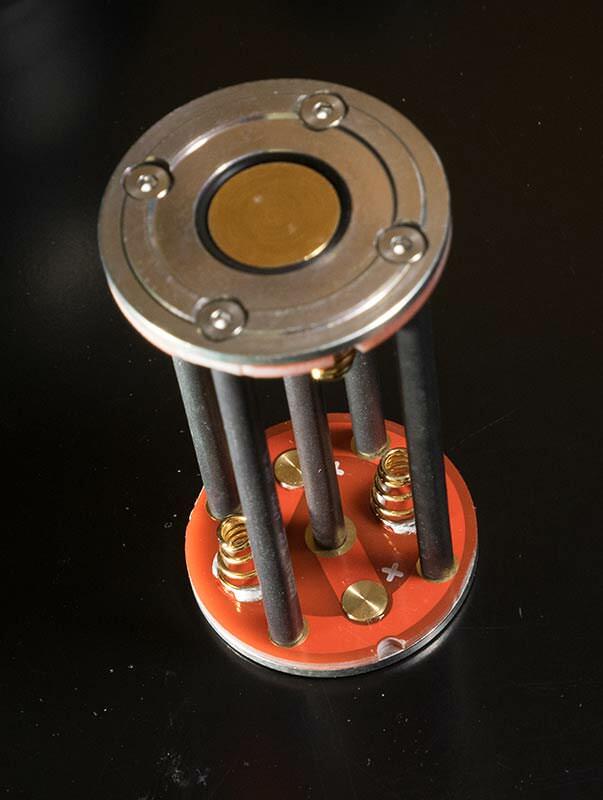 It will very slightly limit the output at extreme temperatures, but to prolong the life of the light and batteries, I recommend stepping it down manually when the light gets too hot to hold. 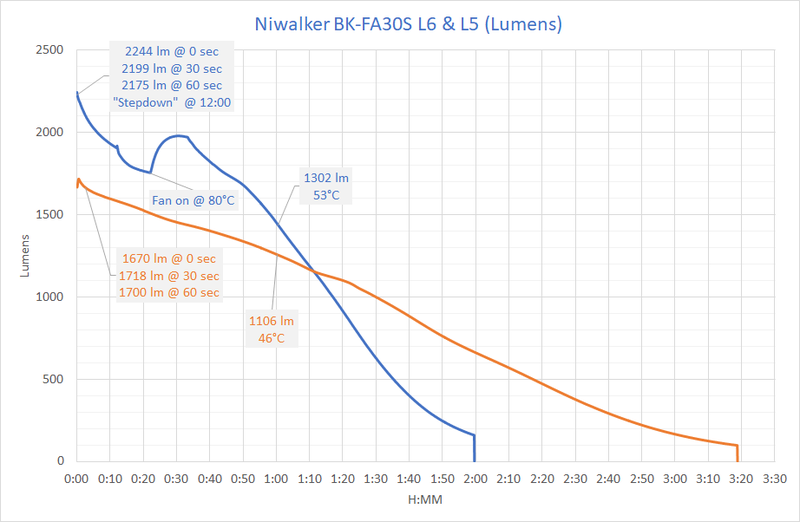 I measured 80°C on the head of the light after 22 minutes on maximum output. At this point the handle with the battery carrier had reached 70°C which is over the recommended operating temperature of most 18650s. 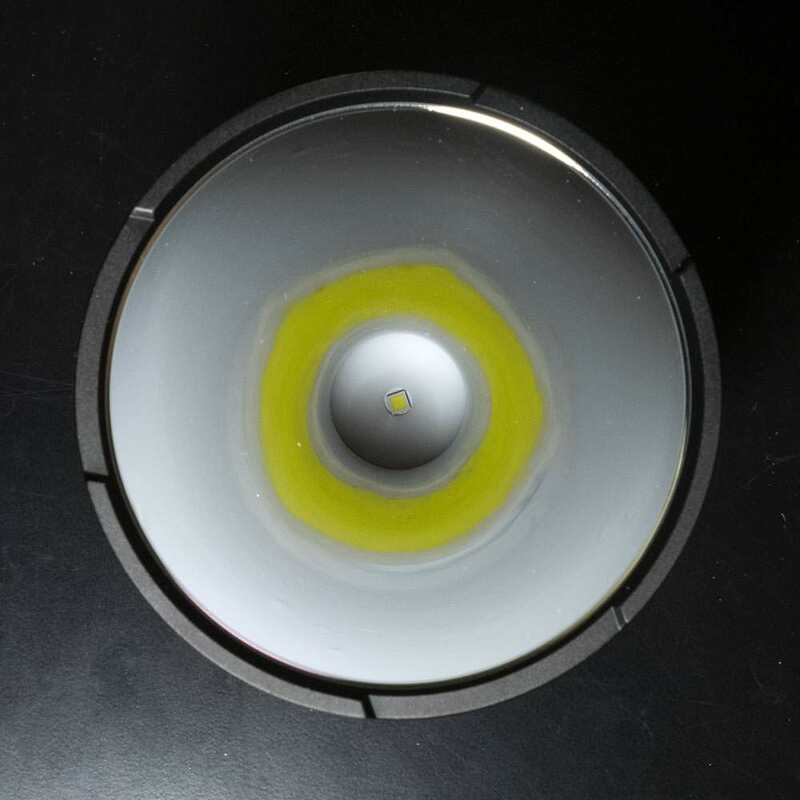 The light gets uncomfortable to hold in about 5-10 minutes depending on the environment. 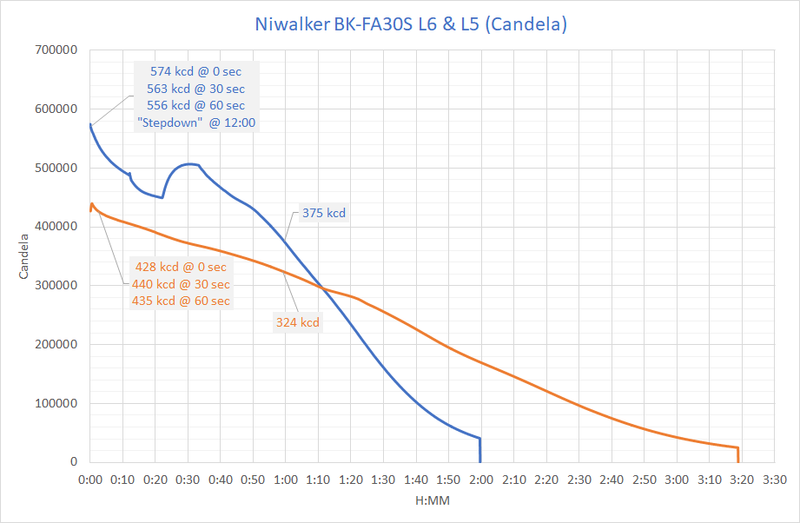 On the second highest mode (L5) it takes about 8 minutes for the head to reach 50°C and 20 minutes for the handle. Maximum head temperature was 65°C at 40 minutes. 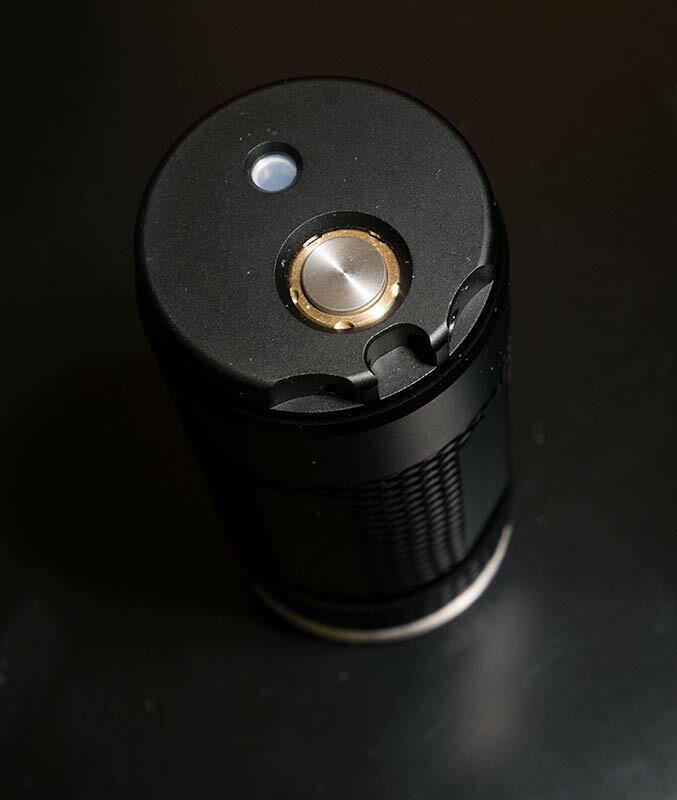 Rest of the modes make it possible to hold on the light indefinitely. L4 reaches 47°C maximum temperature on the head at one hour. The Niwalker BK-FA30S can battle with the best of them. 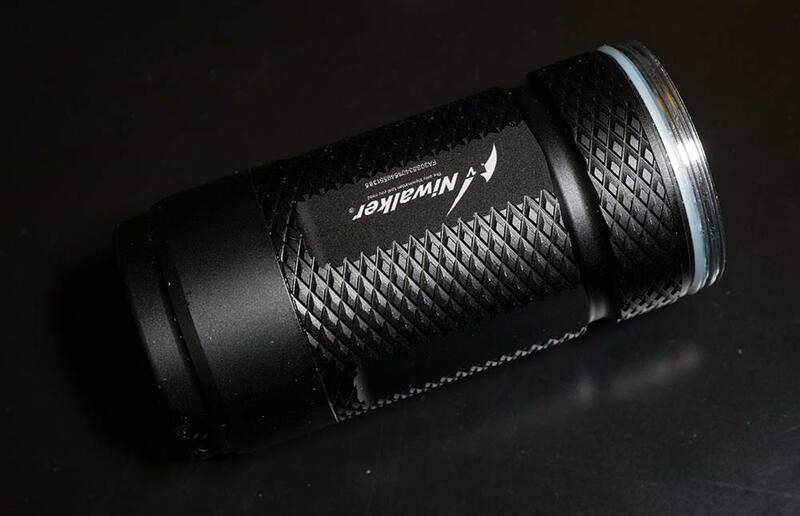 It’s practically on par with the Thrunite TN42 in throw while offering just a bit more output. The prices are also comparable at about $200. Due to a simple current regulated driver, the power drops as the batteries drain. 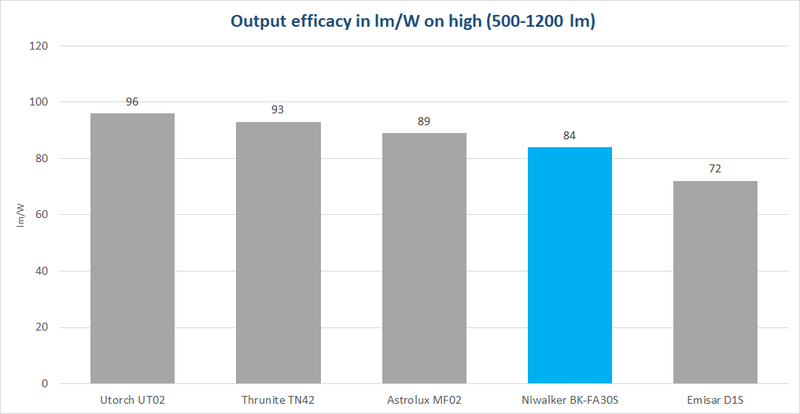 On the lower modes the efficiency is also a bit lower than on the competitors, but not much. The programmable auxiliary switches are a great addition to the already easy to use interface. You can save any mode including strobe to either side switches for quick access from off or on. There are some quirks between the main switch memory and the programmable buttons though, so you might not always get the mode you were expecting. The tint on the higher modes is very neutral cool white (near the black body line), but I would like to see a warmer white version available as well (4000-5000K). As is usually the case with the Cree XHP35 HI, the shift in tint isn’t very visible from hotspot outwards. 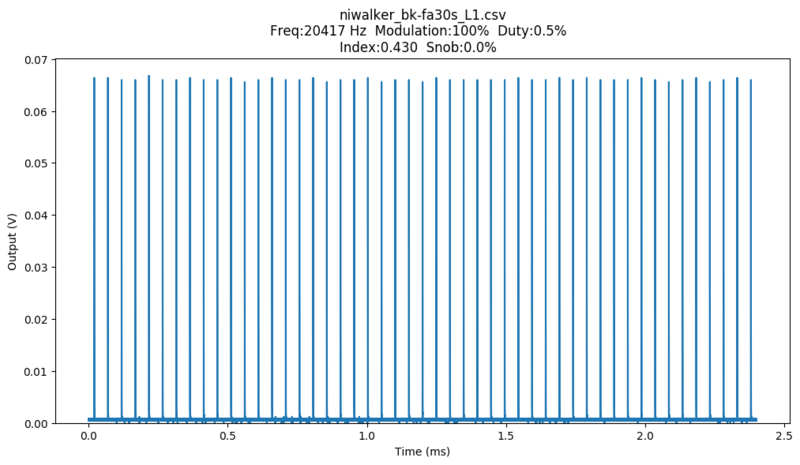 Even though PWM is used to regulate current, it is fast enough (>20kHz) not to be visible to the naked eye. 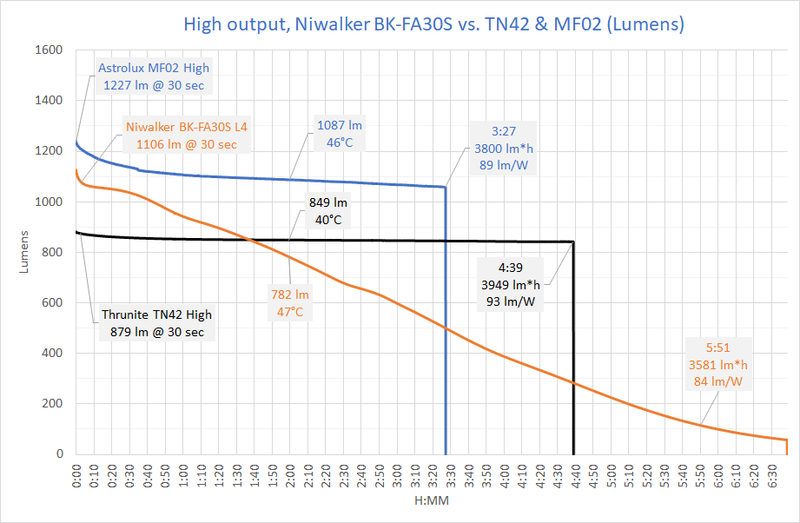 Despite the use of PWM, the tint is significantly cooler when the output is increased. Overall the construction and quality is good, which also shows in the good output and throw measurements. Thank you for detail review~~! So difficult to beat TN42. 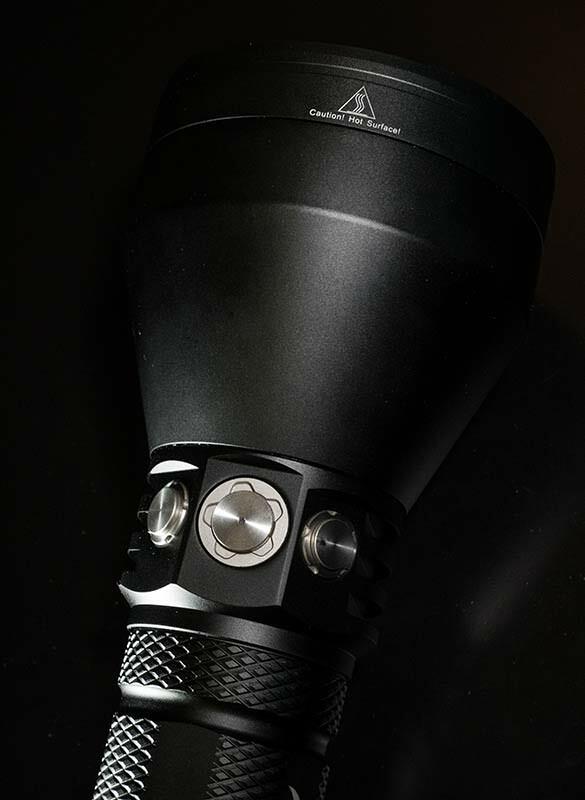 Luckily we have BLF GT, though a bit bigger size. So difficult to beat TN42. 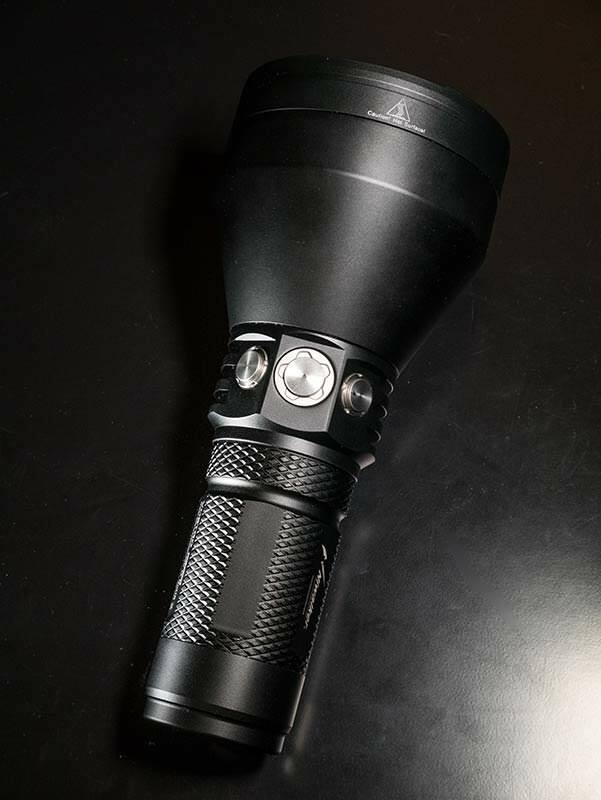 Luckily we have BLF GT, though a bit bigger size. 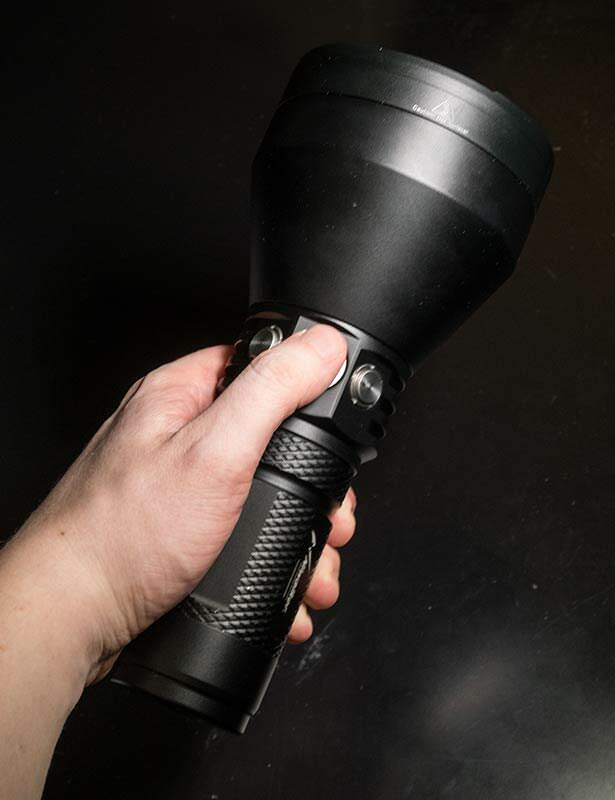 BLF GT is not practical for every use TN42. 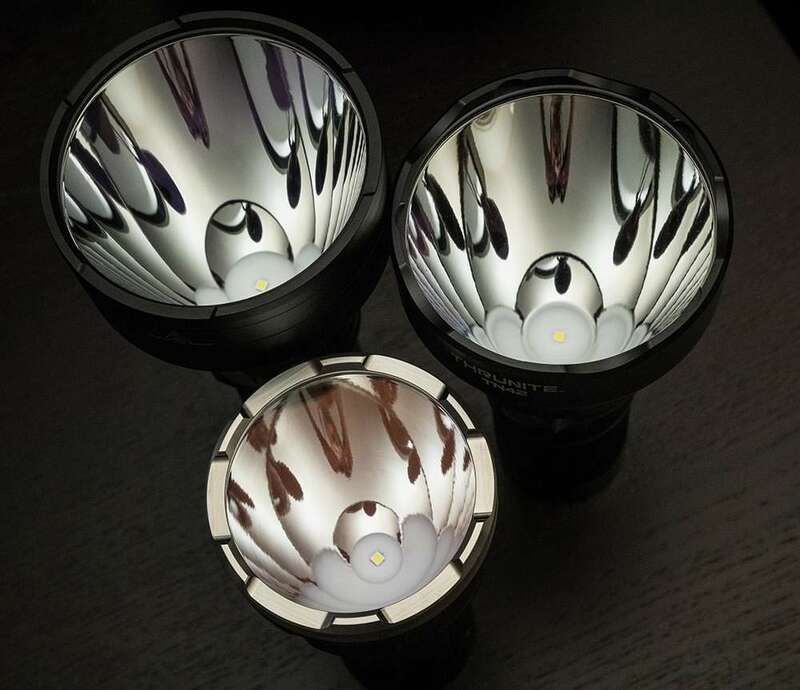 YA, BLF GT size and weight will make many sell their GT. Also the UI listed on the website does not match with my sample, also if you do the double click too fast then the light does not recognize it, the range of timing here needs to be better. If you have not stored Turbo to a side button you have to turn the light off to get to it. Fixed. It was actually supposed to be 556kcd. I agree, they need to refine the UI quite a bit. The interaction between the aux switches and main switches is sometimes very erratic. Too much of the behavior depends on whether you turn the light on with the main switch or an aux switch in the first place.